During 3 years since I moved to Seattle I´ve trying with no success to find fresh duck foie. I have to admit that this is not an easy thing to find in Spain either. You won´t find it in our neighborhood store as foie is considered there kind of a wedding banquet delicacy. I´d just given up when yesterday I discovered by chance at my local Uwajimaya a frozen area full of these weird ingredientes that maybe a minority of Asian, French and Spaniards love to cook: quail, pig tail, rabbit and duck in all their versions: foie, magret and confit. I had tu rub my eyes to be sure that I was not in the middle of a dream… So, in an impulse I decided to grab two beautiful sirloin steaks too to prepare one of these dishes that we enjoy in banquets and Christmas festivities. Once at home I told my griller master, my 11 year old son, to prepare the sirloin on the grill while I sliced the foie blocks in the middle to cook them properly. You only need to prepare them pan seared 2 minutes each side. I decide to grill red bell peppers too because they have a powerful flavor but not too heavy as a starch so they could balance the whole dish. The final touch was a sherry vinegar reduction, a really personal and new creation: 3 tablespoons of vinegar, 3 tablespooons of Extra Virgin Olive Oil and a tablespoon of lavender cooking slow for around 10 minutes. My lavender comes from one of my favorite places in WA, Purple Haze Lavender Farm. A place that I visited two years ago. I was a bit concerned about the marriage between the foie and the lavender but thinks worked out perfectly so I wanted to share this discovery to you in case you want to surprise somebody close to your heart with this beautiful dish. Oh, a final detail. When you put the foie on top of the sirloin add a pinch of Maldon salt. This salt will bring the best from this beautiful fatty piece to your mouth. 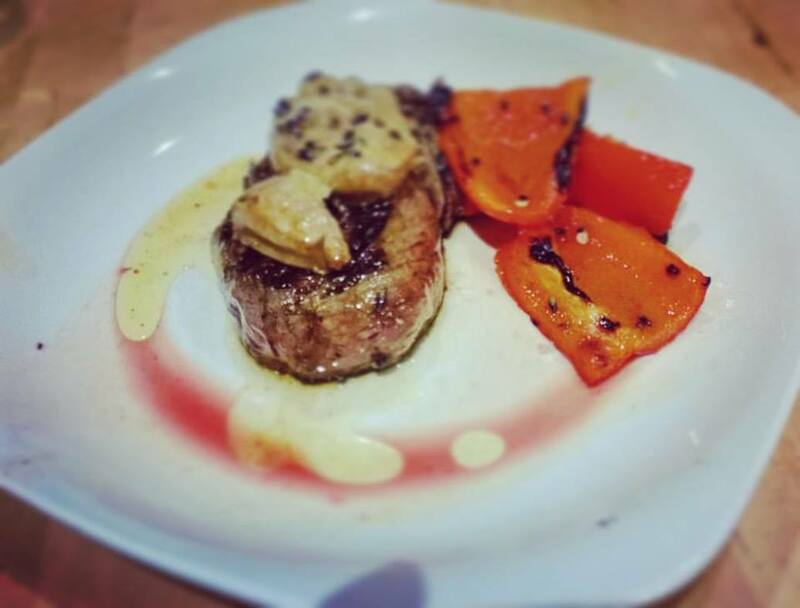 Posted on November 12, 2015, in Recipes and tagged french cuisine, fresh foie, Lavender, Purple Haze Farm, red bell pepper, sirloin, Uwajimaya. Bookmark the permalink. Leave a comment.